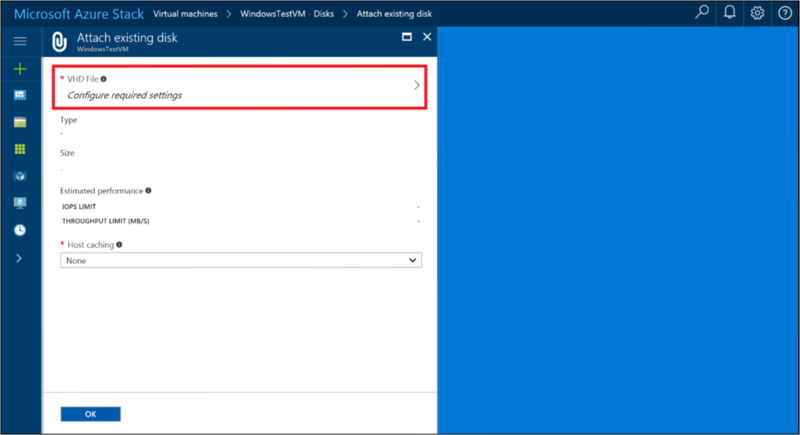 This article describes how to create virtual machine disk storage by using the Azure Stack portal or by using PowerShell. Beginning with version 1808, Azure Stack supports the use of managed disks and unmanaged disks on virtual machines, as both an operating system (OS) and a data disk. Before version 1808, only unmanaged disks are supported. Managed disks simplify disk management for Azure IaaS VMs by managing the storage accounts associated with the VM disks. You only have to specify the size of disk you need, and Azure Stack creates and manages the disk for you. Unmanaged disks, require that you create a storage account to store the disks. The disks you create are referred to as VM disks and are stored in containers in the storage account. If you add one or more data disks to a VM, use additional containers as a location to store these disks. The OS disk for additional VMs should also be in their own containers. When you create VMs, you can reuse the same storage account for each new virtual machine. Only the containers you create should be unique. The following table summarizes how to add disks by using the portal and by using PowerShell. User portal - Add new data disks to an existing VM. New disks are created by Azure Stack. - Add an existing disk (.vhd) file to a previously created VM. To do this, you must prepare the .vhd and then upload the file to Azure Stack. PowerShell - Create a new VM with an OS disk, and at the same time add one or more data disks to that VM. By default, when you use the portal to create a VM for most marketplace items, only the OS disk is created. Create a new data disk and attach it to the VM. Upload an existing data disk and attach it to the VM. Each unmanaged disk you add should be put in a separate container. Disks created and managed by Azure are called managed disks. In the portal, choose All services > Virtual machines. Select a virtual machine that has previously been created. For the virtual machine, select Disks > Add data disk. Enter the LUN. The LUN must be a valid number. Enter the Name of the disk. Select an existing or create a new Resource group. Select the Location. By default, the location is set to the same container that holds the OS disk. Premium disks (SSD) are backed by solid-state drives and offer consistent, low-latency performance. They provide the best balance between price and performance, and are ideal for I/O-intensive applications and production workloads. Standard disks (HDD) are backed by magnetic drives and are preferable for applications where data is accessed infrequently. Zone- redundant disks are backed by Zone redundant storage (ZRS) that replicates your data across multiple zones and are available even if a single zone is down. Create a disk from a snapshot of another disk, a blob in a storage account, or create an empty disk. Select a snapshot, if it is available. The snapshot must be in available in the VM's subscription and location. Add the URI of the Storage blob that contains the disk image. Select Browse to open the Storage accounts blade. For instructions see Add a data disk from a storage account. Select the OS type of the image, either Windows, Linux, or None (data disk). Standard disk costs increase based on the size of the disk. Premium disk costs and performance increase based on the size of the disk. For more information, see Managed Disks pricing. Select Create. Azure Stack creates and validates the managed disk. 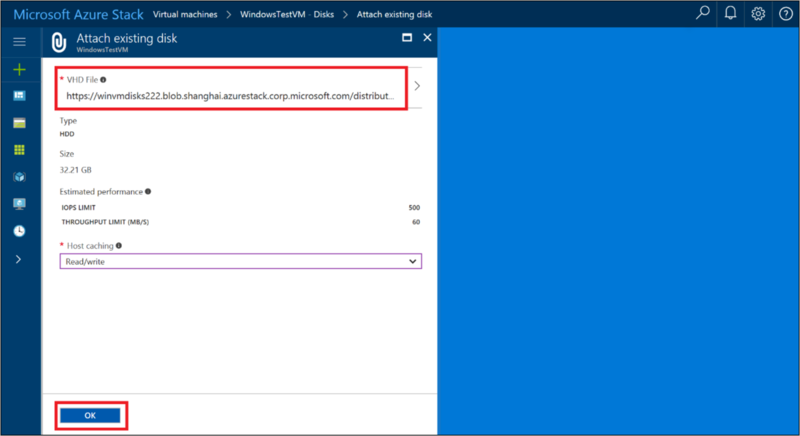 After Azure Stack creates the disk and attaches it to the virtual machine, the new disk is listed in the virtual machine's disk settings under DATA DISKS. For more information on working with Storage accounts in Azure Stack, see Introduction to Azure Stack storage. Select the Storage account to use. Select the Container where you want to put the data disk. From the Containers blade, you can create a new container if you want. You can then change the location for the new disk to its own container. When you use a separate container for each disk, you distribute the placement of the data disk that can improve performance. Choose Select to save the selection. Prepare a .vhd file for use as data disk for a VM. Upload that .vhd file to a storage account that you use with the VM that you want to attach the .vhd file to. Plan to use a different container to hold the .vhd file than the container that holds the OS disk. After the .vhd file is uploaded, you are ready to attach the VHD to a VM. In the menu on the left, select Virtual machines. Choose the virtual machine from the list. On the page for the virtual machine, select Disks > Attach existing. 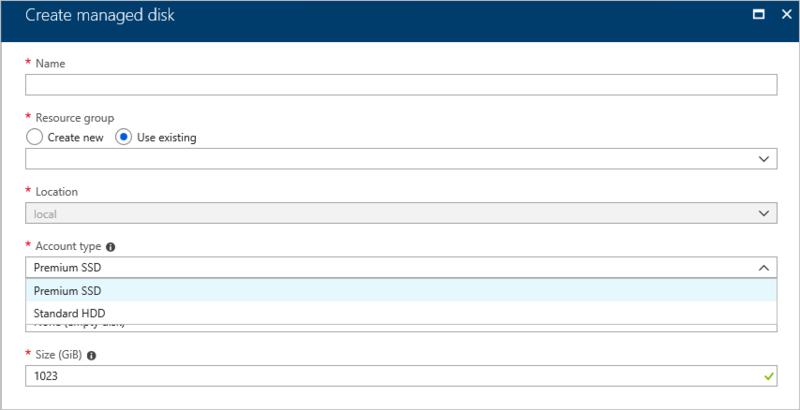 In the Attach existing disk page, select VHD File. The Storage accounts page opens. Under Storage accounts, select the account to use, and then choose a container that holds the .vhd file you previously uploaded. Select the .vhd file, and then choose Select to save the selection. Under Attach existing disk, the file you selected is listed under VHD File. Update the Host caching setting of the disk, and then select OK to save the new disk configuration for the VM. You can use PowerShell to provision a VM and add a new data disk or attach a pre-existing .vhd file as a data disk. 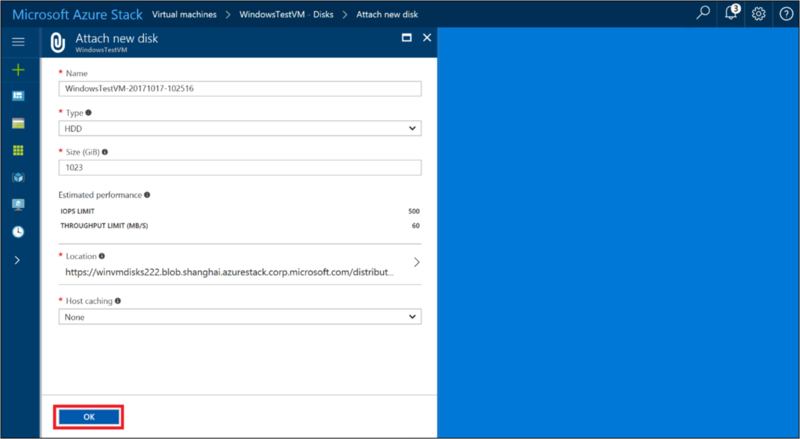 The Add-AzureRmVMDataDisk cmdlet adds a data disk to a virtual machine. You can add a data disk when you create a virtual machine, or you can add a data disk to an existing virtual machine. Specify the VhdUri parameter to distribute the disks to different containers. The following examples use PowerShell commands to create a VM with three data disks, each placed in a different container. The first command creates a virtual machine object, and then stores it in the $VirtualMachine variable. The command assigns a name and size to the virtual machine. The next three commands assign paths of three data disks to the $DataDiskVhdUri01, $DataDiskVhdUri02, and $DataDiskVhdUri03 variables. Define a different path name in the URL to distribute the disks to different containers. The final three commands add data disks to the virtual machine stored in $VirtualMachine. Each command specifies the name, location, and additional properties of the disk. The URI of each disk is stored in $DataDiskVhdUri01, $DataDiskVhdUri02, and $DataDiskVhdUri03. Use the following PowerShell commands to add the OS disk and network configuration to the VM, and then start the new VM. The following examples use PowerShell commands to add three data disks to an existing VM. The first command gets the virtual machine named VirtualMachine by using the Get-AzureRmVM cmdlet. The command stores the virtual machine in the $VirtualMachine variable. The next three commands assign paths of three data disks to the $DataDiskVhdUri01, $DataDiskVhdUri02, and $DataDiskVhdUri03 variables. The different path names in the vhduri indicate different containers for the disk placement. The next three commands add the data disks to the virtual machine stored in the $VirtualMachine variable. Each command specifies the name, location, and additional properties of the disk. The URI of each disk is stored in $DataDiskVhdUri01, $DataDiskVhdUri02, and $DataDiskVhdUri03. The final command updates the state of the virtual machine stored in $VirtualMachine in -ResourceGroupName. To learn more about Azure Stack virtual machines, see Considerations for Virtual Machines in Azure Stack.